April 7, 2019 OPENING DAY!!!! Please consider donating your gently used athletic cleats, shin guards and soccer ball to another child within PVSC. Fall Registration is now CLOSED! We are at capacity in all divisions for our Fall Intramural soccer programs and registration is CLOSED. Fall Intramural and SCSL soccer registration will be closing Wednesday, August 1st, 2018. Please register today to ensure your spot. Registration for our Winter Indoor Training and Open Soccer Programs is now open. More details can be found here. Thanks to all the volunteer coaches, players and parents on another successful Intramural and SCSL soccer season this Fall. Registration for Spring '17 will open up in mid-December. Due to the expected heavy rain throughout the day all PVSC Intramural games are canceled today. Final games will be next Sunday, November 5th with a schedule released in the next day or two. Make-up picture Day is this Sunday, October 8, 11 AM to 1 PM. No appointment needed, just walk up and have your pictures taken. Reminder to all coaches that we have our pre-season meeting Wednesday, September 6th at Manderach Park Limerick at 6:00 PM. Uniforms will be distributed as well. Registration for Fall Intramural and SCSL Soccer is now open and will close on July 30th. Registration today to avoid any late fees and ensure your spot for Fall Soccer. All fields are closed today, Friday, May 6th due to the rain. Please check back regarding field closures for this weekend. PVSC was founded by former "Perk Valley" players and coaches who wanted to share their experience and "Give Back" to the children of the Perkiomen Valley.The mission of PVSC is to work as a strategic partner with the Perkiomen Valley School District to implement superior programs and services designed to support the development of its children. Our focus and drive is a commitment to cultivate and promote soccer within a teamwork-oriented culture that offers competitive opportunities to foster individual skills and sportsmanship. Our club slogan "Go for the Goal." is based on the belief that PVSC players are not only aimed at scoring goals on the soccer field but that our ultimate goal is to help develop well-rounded children who enjoy the game and have fun playing. We believe that this will increase participation in the school soccer program and will grow and develop future high school and collegiate soccer players. -Furthering the development of the Perkiomen Valley School District's relationship with the community as the "heart and soul" of the community by working in partnership with the PVSD. -Providing a "Fun" and educational atmosphere- Having the experience to understand and implement age appropriate play and training to maximize the children's enjoyment and love of the game. -Providing a structured program to enable players to participate and grow from youth to the high school level and assist them in reaching collegiate level play. -Developing appropriate training/playing facilities for both indoor and outdoor use. 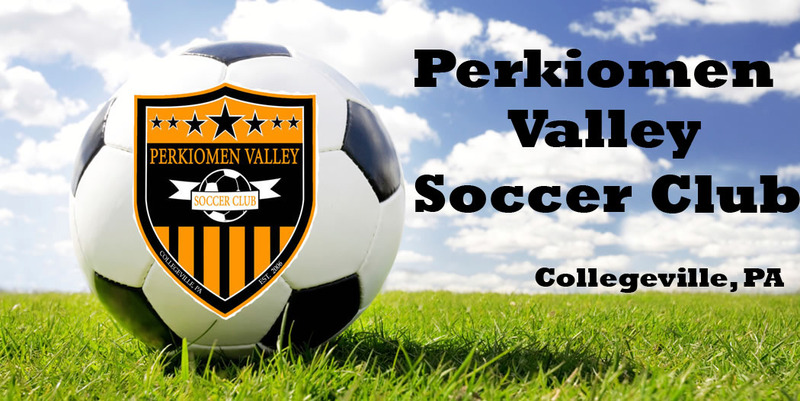 -Improve the level of play and the level of participation in the Perkiomen Valley school soccer programs and facilitate the advancement of the High School programs. -Providing a mentoring program to facilitate Perkiomen Valley upper classmen into proven leaders. -Facilitate the advancement and promotion of highly skilled players. -Facilitating player development to enhance a player's ability to achieve college scholarships.